You’ve decided you want to take a walking tour but you’re not sure how to pick one. This is where the fun begins! Now the daydreams take form, colored in by the information your about to sift through. First, determine how many days you want to walk and how much mileage you are comfortable walking in a day. Multiply your desired walking days by the daily miles and you’ve arrived at a rough mileage goal for your walking tour. Now that you’ve narrowed down some variables, it’s time to start researching. If this is your first foray into a walking tour in the U.K., start by looking into one of the U.K.’s national trails. National trails are well maintained by the government and are therefore well signposted, providing the walker with a trail that will require little navigational skill. Additionally, you should have no problem finding information, including detailed guidebooks, lodging and travel information for a national trail. The distance of the national trails ranges from 80 miles all the way up over 600 miles, with most in the 100-200 mile range. Narrow your choices down to trails that meet your mileage goal. Now research each of the trails and see if any are particularly interesting. Would you prefer pastoral countryside or rugged coastline? Scenic villages or historically relevant cities? Wales? Scotland? Find a trail that excites you. If there is a trail that you’d love to walk but it’s too long, don’t be afraid to walk the most interesting stretch. Many people walk trails in segments. There are no rules here. Another great way to research trails is to look at websites selling self-guided walking tour services. These sites often have great descriptions of the trails with pictures and reviews. Also, these sites will advertise popular, safe and well-marked trails that are not necessarily national trails. I particularly like Macs Adventure. If you want to really geek out, visit The Long Distance Walkers Association website, which details over 1,400 routes in the U.K.
Keep in mind that not all mileage is created equal; some trails are more challenging than others. Make sure your research includes an understanding of the terrain you will be walking. The walking season in the U.K. is generally April through late Septemeber or early October, with August being the busiest time of year. If you decide to try for a hike in Spring or early fall, check historical weather data for the area. Temperatures averages can change significantly week to week during these months. Winter hiking is not unheard of, but many accommodations shutter during the winter. Whenever you go, be prepared for rain. There’s simply no way can guarantee a dry walk but historical weather data is helpful hedging your bets. There are a couple considerations when deciding which day you should start walking. First, plan to stay near the trailhead the night before you start. Secondly, consider starting on a day other than Saturday. Saturday is a popular starting day. Not only do you run the risk of a lot of traffic on the trail but lodging along the trail will be more difficult to reserve. Planning a walking tour requires quite a bit of planning and making reservations. Generally, it’s not something you can do a few weeks before you leave. On the popular trails, during the summer months, you’ll likely need two months at a minimum. Do you need to be in shape to walk a long distance British footpath? Yes and no. Yes, you should be able to walk at least 10 miles a day. No, you don’t need to be an athlete or experienced hiker. Remember, British footpaths are generally not nearly as rugged the average mountain trail in the U.S. Most of the time you will be walking through cleared pasture, which means there are very few obstacles. Many people well into their 60s and 70s can be found on the footpaths. On the last mile of the Dales Way, I encountered some Americans (the only Americans I ran across the entire trip) just finishing up the same trail: a group of rotund Alaskan women near their sixties. How fit do you need to be? As fit as a rotund Alaskan woman near her sixties. Common sense rules here. Comfortable hiking gear and walking distances you know you can handle will make the difference between a wonderful stroll and a mildly taxing hike. Know your limits and learn to take your time and enjoy the journey. If you’re just plain out of shape, don’t try to walk 15+ miles a day and choose a trail that is not hilly or boggy. I love walking alone. I encourage anyone who thinks they might like walking alone to give it a try. For those who would rather be with other people, limit your group to roughly four people. Many of the accommodations on the trail have limited lodging. The more people in your group, the more difficult it will be to secure lodging for the whole group in the same area every night. This has been Part 2 of The American’s Guide To Planning A British Walking Tour, for Part 1: The What And Why, click here, and Part 3: The How. During my walks, many of the British folk I meet are baffled why I would come all the way across the ocean to hike in their backyard. They have a point. The United States is unmatched in terms of pure natural aesthetic and diversity. From the Grand Canyon (virtually in my backyard) to the coast and virgin redwoods forests of California to the bucolic farm country of New England, there’s really no place like the U.S.
Generally, the type of walking tour with which this blog is concerned is a self-guided hike on a long distance end-to-end British footpath. While these trails generally dip in and through rural farmland and villages, they never really stray too far from civilization. A day’s walk will usually include breakfast, lunch, and dinner in three different and distinct villages. Every night, a walker will lodge in a B&B, inn or the occasional hotel. This is not the type of wilderness hiking we are accustomed to in the U.S. Most Europeans I’ve talked to don’t share the American’s fascination with historical sites. When you grow up in a place where there are remnants of Neolithic settlements, the Roman empire, and medieval societies, history loses its novelty. With the exception of the isolated and sporadic native American ruins, there are very few signs of human history in the U.S. A 100-year-old house is considered historically significant enough to exempt the owner from certain real estate taxes in some U.S. states. Meanwhile, living in a 300 old structure in some European cities not uncommon. In the Dales, I visited a 12th-century Norman church that was built on the remains of an Anglo-Saxon church, which itself was built on the remains of a Roman settlement. In the church stood three 9th-century Anglo-Saxon crosses covered in flowing designs and, in the corner, were two 4th-century Roman altars discovered in the oldest part of the foundations of the church. It’s such a thrill to see and physically touch the tangible continuity of culture. I could run my fingers along grooves in stone carved by an ancient Roman. Real. Tangible. History. English and Welsh law recognize a unique principle known as “Rights of Way.” This right grants the walking public access to a network of public footpaths and bridleways that honeycomb the countryside. These footpaths are trails that often run through private property. In Scotland, a walker has the “Right to Roam” over almost any private land as long as they act responsibly. Over the years, long distance paths (each often referred to as a “Way”) through and to points of interest have developed. These trails, while often passing through protected wilderness areas, most of the time, pass through rural but largely uninhabited areas that are dotted with villages and towns. Contrasted with the American system of trails, where we generally hike there-and-back routes through rugged and remote virgin nature, the British walking experience includes interaction with people, culture, and history. The British walking tour means, more times than not, you’re in a small village, each with a unique history and feel, for lunch and another village for dinner. In the U.S., if you find a trail that passes so regularly through inhabited areas, you’re likely to find yourself eating at Burger King and staying in a Motel 6. Not quite the same experience. British long-distance footpaths are well marked with regular waymarkers. The waymarkers are regular enough that you could almost get away with walking an entire 100-mile route without a map. 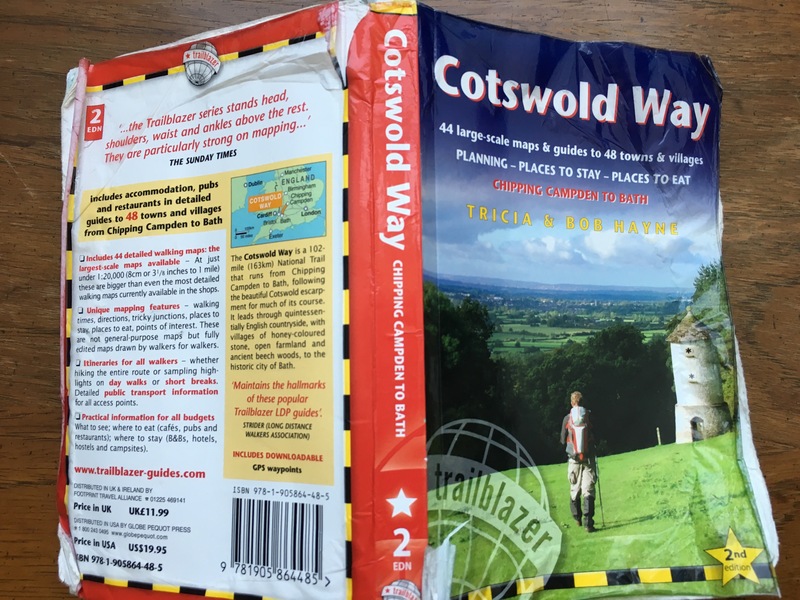 That being said, there’s a thriving British walking trail guidebook market. These guides provide the walker with detailed maps as well information on local points of interests. With established routes, the locals have fostered a cottage (literally) industry of services that cater to walkers. B&Bs, inns, and the occasional hotel, offering comfortable lodging and hot meals, are conveniently located along the trails. Baggage handling services are available on many trails (more on that later). Lastly, unlike the U.S., most of the trailheads for a long distance footpath are accessible by public transportation. The country has an outstanding train system that will likely get you within walking distance of a trailhead. In rare cases where a train doesn’t run to a trailhead, a train can get you within a few miles and buses and taxis can take you those last few miles. For the American, Britain offers all the benefits of experiencing a different culture without the stress of an insurmountable language barrier. True, American and the British are not that different. But they are different enough that we can confuse each other whilst speaking the same language, and that’s kind of amusing. Alright, mate? Walking the countryside is an excellent way to bypass the crowds, high cost, and gimmicks of the tourist honeypots and actively experience the history and culture of Britain firsthand. Exploring the ruins of an off-the-beaten-path hill fort or simply chatting with a local over a pint of real ale brewed down the street will result in a more authentic and more memorable experience than passively whipping around on a double-decker site-seeing bus in London. While we don’t need to leave the U.S. to experience bucolic beauty, rural England has it in spades. Thatched roofs, dry stone walls, and cobblestone bridges, the British countryside reflects the charming reality of the absurd rococo romanticism of Thomas Kinkade. There’s something very special about sauntering through an old sheep field, into an ancient forest, and then into a picturesque British village. Thousands of years ago, Britain was more or less a giant forest. Over the millennia virtually all the forests were felled. What was left was a land sculpted by men. Asymmetrical property lines resulting in patchwork landscape. We tend to think of nature as a place unmolested by humans, but in England, there are very few places that can claim such a description. Nature in England has been tamed and domesticated. But it’s an ancient domestication, resulting mostly from the hands of ancient people rather than the earth churning mega machines that spit out strip malls that we have in the U.S.
There’s nothing quite like it in the states. In summary, Britain offers a unique and accessible walking experience not available in the states. It’s a uniquely beautiful place filled with history and culture that an American can experience without feeling isolated by a language barrier. This has been Part 1 of The American’s Guide To Planning An British Walking Tour, click here for Part 2: The Where, When, and Who and Part 3: The How. When I turned 18, my father offered me a choice between two birthday/graduation gifts: a new computer or a solo plane ticket to Europe and month long Eurorail pass. I chose the computer. It wasn’t until nearly a decade later, after finishing law school (a few hours after taking the California bar, to be exact), that my wife forced me to travel out of the country. We had a great time. It was the first time I experienced the joy of international travel. During this trip, my interest in the English walking tour was renewed while driving through the Lake District. Incidentally, we spent the night in a filthy inn not more than a mile off the Dales Way in Kendal. Falling in love with real ale in northern England 2005. Old Speckled Hen, if memory serves. It took a few more trips to Europe and some soul crushing life events to finally spur me to go out and travel on my own – to finally do something that always scared me. And I am so grateful that I did. I often wonder if my life would have taken a different course had I took that trip as an 18-year-old. It’s not like I didn’t want to. But I was terrified at the prospect of being on my own so far from home. I was not confident to trust myself to be spontaneous. But knowing myself now, I believe I would have gained the confidence to take more chances in life. Maybe I would not be so hesitant to try for the things that I want. Why do we hesitate to pursue things we dream about? Granted, there are often real obstacles in the way our dreams. But, speaking for myself, more often than not, I made obstacles where there weren’t any. Truthfully, I wanted obstacles to keep me from being bold enough to do something daring. I made excuses because I was either too scared or too timid to pursue the thing I wanted. I know that I’m not alone in this. When I talk about my trips, one of the first questions is always, “who did you go with?” People often seem surprised that I go by myself. I don’t often get asked why I go by myself, but I suspect people wonder. It’s not that I don’t like traveling with other people. Some of my most fulfilling adventures have been with my wife and close friends. However, there is something about a trip alone that satiates a special metaphysical longing. There are also more practical reasons I intentionally travel alone. The first reason I travel by myself is because it scares me. What if I unwittingly upset a local or get lost or mess up a lodging reservation? What if I get lonely? What if I need help? Traveling alone forces me to confront my petty fears. Not only do I confront them, I come to realize how petty they are and thereby produce a new level of confidence. This confidence banishes that nagging fear that leads me to create obstacles that keep me from doing what I want. Similarly, I want to be spontaneous. I’m not a spontaneous person. But I want to be. Any amount of spontaneity I currently have is attributable to my wife making me do stuff of which I was previously too afraid. Spontaneity scares me. It makes me uncomfortable. Those petty fears are at the root of it again. On the trail, by yourself, it is hard not to be spontaneous. When your plan includes venturing to point A from B with a whole lot of mystery in the middle, you end up on unexpected adventures or meeting new people. When I’m traveling with someone else, spontaneity suffers. There’s often less room for spontaneity because there are always more plans or we might be less willing to strike up a conversation with strangers because we are content with each other’s company. Traveling alone also allows me to think without distraction. To this end, during my first walk, I made a decision to turn off my phone (not that it ever had service anyway) and not listen to music. I don’t want distractions. I certainly don’t want to feel like I need to keep a conversation going. I want my brain to take my thoughts where ever it wants. I feel more creative and introspective when I’m walking alone. And that’s not just a perception. There’s solid science to the notion that walking boosts creativity. The older I get, the more I seem to need time to clear my head and reflect. It is a necessary catharsis. Lastly, when I travel I alone, I do what I want. I could happily hit three different pubs in a day, but I know that is not most people’s idea of fun. Roman villa a mile off the trail? I’m going. But I don’t really get excited about shopping or botany. Alone, I don’t have to subject my interests on anyone and I don’t have to be subjected to someone else’s interests. It’s me time. In summary, I travel alone because it transforms me closer to the person I want to be. A person who is willing to step out of his comfort zone to obtain those things he wants. A spontaneous person willing to take adventures as they present themselves. A person with clear thoughts. I didn’t take that trip when I was 18 but I want to be a person who is bold enough to take the next one.